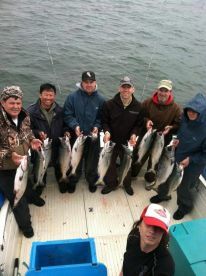 Anglers on the west coast can’t get enough of the deep sea fishing Washington dishes out year after year. And who can blame them? With Salmon, Halibut, Lingcod, and Tuna on the menu, the waters offshore are a regular seafood buffet! More than just tasty, these brutes put up a mean fight. Dig in and you’ll find yourself battling massive Chinook Salmon, “barn door” Halibut, and tireless Albacore Tuna. Bring your stamina and your appetite, because this is one fishery that will leave you hungry for more. Most of the fish you’ll find here live off the coast of Washington year-round, but local regulations turn deep sea fishing into a seasonal sport. For the area’s finest weather and fishing opportunities, plan to set sail in spring and summer. The season for ocean Salmon fishing generally opens in July and runs through September (specific fishing zones may have more limited seasons). 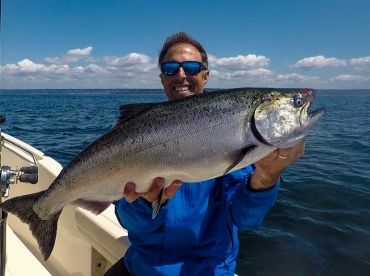 In years that end with an odd number, Pink Salmon brush past the northern tip of the state on their way through Puget Sound, giving anglers there an extra dose of Salmon action at the end of summer. 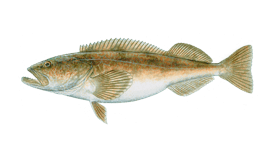 Lingcod are open to harvest from mid-March through October, joined by Halibut in May. Depending on where you fish, these species could be just a few minutes from the dock or dozens of miles offshore. 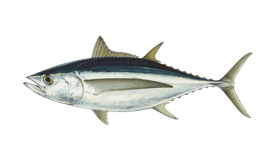 In August and September, you can intercept the Albacore Tuna run 40+ miles offshore. 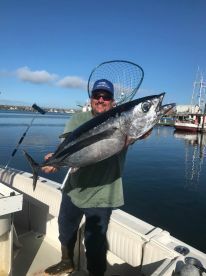 These trips typically last 10 hours or more, with some anglers opting for an overnight trip so they can make the most of the Tuna fishing Washington has in store. Only a handful of locations on the coast have access to Washington’s deep sea fishing grounds. While the list may be short, it offers plenty of variety, spanning more than 150 miles from north to south. Each location brings something special to the table, proving just how much variety you can find in these waters. Perched at the southernmost tip of Washington State, Ilwaco is known for its summer Salmon fishing. 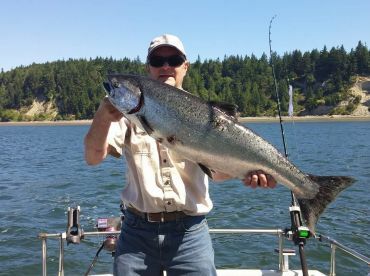 You can catch Chinook and Coho here from July through September, and odds are you’ll catch tons of them. More than half of the Salmon caught in the region’s ocean fisheries are hooked off the coast of Ilwaco. Around the same time of year, there’s excellent Tuna fishing 30-50 miles offshore. One factor to bear in mind is that heading offshore requires crossing the Columbia River bar, one of the most dangerous in the country. Always check the weather forecast ahead of time and fish with a local guide. When it comes to Chinook Salmon, Westport has Ilwaco beat. Over half of the area’s Chinook are caught here, making this town the premier Chinook fishery on Washington’s coast. This also happens to be the most well-known fishing port in the state, and it’s no surprise when you take a look at the prospects offshore. Fishing 6-10 miles offshore brings you face-to-face with Chinook and Coho Salmon, Lingcod, and Rockfish. When the Halibut season opens in May, anglers head 25-50 miles offshore for some serious jigging action. The Tuna run is within reach by late summer, with "Albies" swimming 40-100 miles off the coast of Westport. Similar to the situation in Ilwaco, The Grays Harbor bar can be dangerous for anglers fishing out of Westport and the nearby town of Ocean Shores. It’s important to pay close attention to weather conditions and make sure you have an experienced captain guiding you. The rocky coastline of La Push is known for its rugged and mysterious beauty. Trips in this area typically stay 3-8 miles from shore, where you’ll find Lingcod, Rockfish, and exceptional Salmon fishing. Scores of Rockfish, Greenling, and small Lingcod near shore make for light tackle and fly fishing fun. Fishing a little farther out gives you access to good numbers of Halibut. The bar at La Push poses less of a threat than those at Ilwaco and Westport, but a strong southerly wind can complicate your trip. Keep an eye out for Sea Otters while fishing here for a special treat. At the far north of Washington’s coast is Neah Bay. Similar to La Push, this area is known for its rocky shoreline, which makes for excellent bottom fishing grounds. Neah Bay is an excellent introduction to Washington deep sea fishing. Here, there’s no dangerous bar to cross and local waters are far more protected than any fishing grounds to the south. Small charter boats (14-20’) from Neah Bay, Snow Creek, and Sekiu make good use of these stomping grounds. You can enjoy stellar Chinook and Coho Salmon fishing in Neah Bay from July through September. In odd years, Pink Salmon show up here, too. Cape Flattery nearby offers excellent bottom fishing for Black and Yellowtail Rockfish. The season for Rockfish runs from March through mid October. Depending on regulations, Lingcod may not open to harvest until April in this area, but it’s well worth the wait when you hook into 40+ lb Lings! Neah Bay has access to some of the best Halibut fishing in Washington, just 20-30 miles away at the fishing grounds known as Swiftsure Bank and Blue Dot. 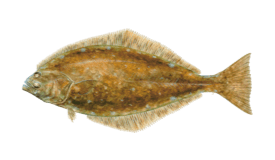 Fishing closer to shore will produce fewer but bigger Halibut, with the opportunity to land a real “barn door” Hali weighing 100 lbs or more. Bottom fishing will help you catch Lingcod, Halibut, Rockfish, and other species that live near the seafloor. Jigging near rock piles and kelp beds produces a variety of Rockfish. Halibut take to whole Herring and Squid on a variety of jigs. Anglers often troll for Salmon and Albacore Tuna. A special technique in Washington known as “mooching” is another common method used to catch Salmon. Unlike trolling, mooching involves holding the rod in your hands so that you can feel the fish strike.